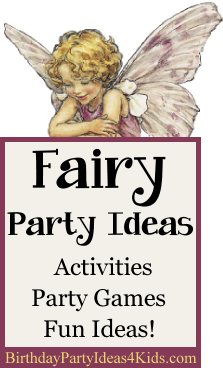 Fun birthday party ideas to create a magical Fairy party! Make (or buy) star shaped fairy wands. Tie pink and green ribbon to the top of the wand and attach a small card with the party information. Inside place a little fairy dust - glitter! Wrap the invitations in pink tulle and tie a green or pink bow around it. Embellish pretty note cards by hot gluing small silk flowers to the front on the top or going down the side of the card. Leading into the party area and along the walkway or driveway sprinkle glitter (fairy dust) and place giant artificial flowers around the entrance. Decorate the party table in purple, green, pinks and white. Helium balloons can be filled and curling ribbon tied to them and then allowed to stay on the ceiling of the party room so kids can pull them down and play with them during the party. Make a fairy world come to life by draping purple and pink tulle across the wall and ceiling. Fill glass vases with large flowers (real or artificial) and tie green, purple or yellow tulle around the vases. Hang strings of Christmas lights around the party area, plants and ceiling. Place pixie sticks in vases on the party table - tie with a pretty bow. Set up a tea party for the guests with pretty cups and saucers. Serve unsweetened pink lemonade and let the Fairies add in their own sugar cubes. See our Tea Party page for more fun ideas. Let party guests make some cute fairy slippers out of flip-flops and pieces of green, pink, purple and yellow fabric. Directions for our funky flip-flops. Make pixie dust art with sand art necklaces or containers. Find kits in pastel colors and let guests make a necklace or container to take home. Guests make their own fairy skirt. Cut long pieces of ribbon that are big enough to go around the child's waist with room left over to tie a bow. Cut long strips of tulle in green, pink, purple and yellow about 2" x 3 feet. Lay the ribbon on a flat table and show guests how to fold the tulle strip in half, place the folded loop under the ribbon and then take the two ends of the tulle and put them through the loop. Pull the ends so that the loop closes over the ribbon attaching itself into a loose knot. Continue along the ribbon until it is full. 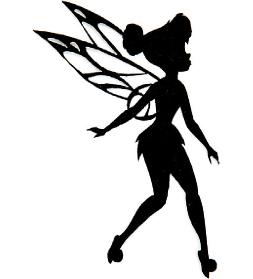 Tie skirts around the waists of the fairies. Pieces of ribbon can also be cut into strips and added to skirt with the tulle. For younger children make the skirts ahead of time and let them add the ribbon. Hide small objects around the party area, backyard or park for the guests to find. You can use colored plastic rocks, flowers or similar objects to hide. (For young children under the age of 3 be sure to hide larger items to prevent a choking hazard). Let the fairies turn in their items for prizes when all the items have been found. Played like traditional tag except one player starts as Tinkerbell and holds a wand. She then must tag the other players with the wand. Once players are tagged they must freeze and can't move until another player comes by and tags them - they must then both clap their hands and say "I believe in fairies" before they can move again. When everyone is frozen a new Tinkerbell is chosen. To play this relay race game guests are divided into two teams. Each team is given two sheets of colored paper (heavy cardstock is best). Across the room set up a chair or a big flower that shows the kids where they have to run around before they go back to their team. The fairies can only use the 2 sheets of colored paper to move across the room. They will step of one, put the other in front of them, step onto it, pick up the one they just stepped off of and place it in front of the one they are standing on. They continue like this until they have gone around the flower and back to their team where the next person in line takes a turn. A Fairy Tea Party would be fun - let guests put colored sugar (pixie dust!) into their tea (we use unsweetened lemonade and let them add sugar or sugar cubes by themselves).